Client Server TLS v1.2 U TLS ? Client Server TLS v1.2 Ya. Here's my ce ! . Client Server TLS v1.2 I'm ready! Client Server TLS v1.3 Let's go! WebSocket Client Server GET / HTTP/1.1 S prechen sie websocket? WebSocket Client Server GET / HTTP/1.1 HTTP/1.1 101 ¡ Sí! 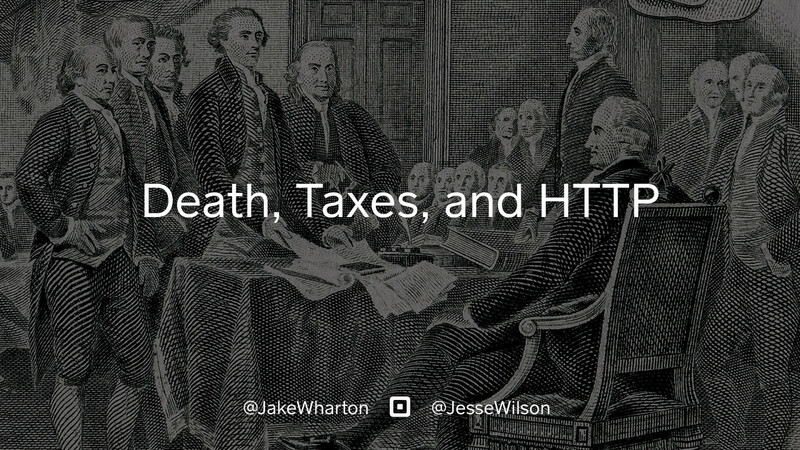 View Death, Taxes, and HTTP on Notist. ‘Tis impossible to be sure of anything but death, taxes, and HTTP. This talk will explore some of the overhead inherent to HTTP and how it can be optimized or eliminated for more efficient networking. Jake puts presentations on for free. You can too.